Upon receiving your charter request we will contact you to arrange the charter dates depending on the availability of S/Y Deminata. You can explore our website and find various photos, specifications and layout of the boat. We strongly recommend you to have a look at our section with suggested sailing itineraries and travel information for each sailing area and islands within. As soon as you find the suitable charter period and you agree with the price offered, you will be requested to send us a copy of your ID (preferably passport) and after that we will send you the charter agreement (contract) for sign and the invoice with payment details. You will be sent a charter agreement detailing your charter yacht, the dates of the charter, and the cruising location and costs. Upon reading and signing the agreement the first payment ( 50% of the full price) is due. The account and payment instructions will be sent with the agreement. The balance of charter fee should be sent four weeks prior embarkation. Security deposit is paid upon embarkation. Two weeks prior embarkation, you should send us your crew list, copies of skipper and co-skipper sailing credentials and your arrival details. We are always at your disposal for any further requests and services you might need such as provisioning, transportation from the airport, hotel accommodation, information on worth visiting destinations in Greece. You can also visit the "Frequently Asked Questions" section of our website for further information regarding your sailing holidays in Greece. We are looking forward to welcoming you on board! 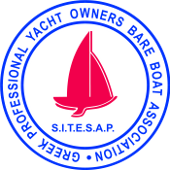 Dinghy with Outboard, Autopilot, Bowthrusted, GPS, Plotter, Taxes, Port fees in embarkation/disembarkation port. All yachts are checked at the end of the charter by diver. Bedlined, towels, blankets (one set per week). Fuel consumption, Water consumption and Port fees in the ports except from embarkation/disembarkation, Provisions, food, drinks, cleaning and transfers. Downpayment : 50% of the charter fee, should be paid latest by seven (7) days from booking confirmation. Balance payment : 50% of the charter fee, should be paid 4 weeks prior embarkation. If no payment is received within seven (7) days from booking confirmation, charter will be considered as cancelled without further notice.